Today we're going to play a rousing game of....drum roll please......da da da da.....ok I actually don't know how to type a drum roll (I may have even googled it), so just pretend I made a drum roll sound.......we are going to play What's in My Bag! You see I am a nosy person. I AM that person who likes to look in other people's cupboards. I love to see how people organize, store, etc. I also love to see what people buy. It always gives me great ideas on stuff I could and definitely COULD NOT use/buy. I also am fascinated by what us ladies put in our purses. 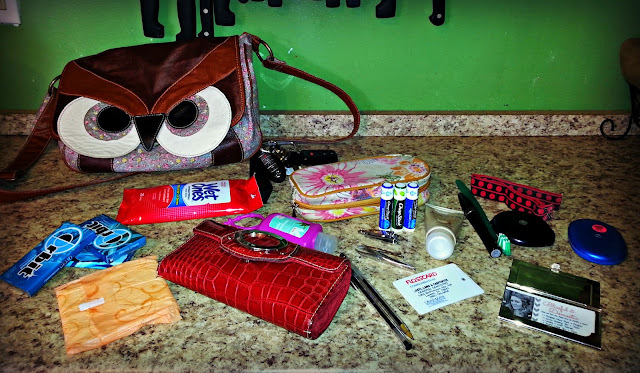 Because I am a big GIGANTIC weirdo, I decided to share what's in my bag today....because I know at least one of y'all is a curious mama like me (c'mon I can't be the only one right?) and wants to know what I am storing in that thrifted owl purse of mine. Sidenote: I snagged that beauty for $6.00 at a thrift store. Say What?!?!? I know it's killer! I totally heart it! So today I am taking you on a "tour" of my purse....I am sharing my must haves and all that goodness. To start off I have my wallet. It holds all my pertinents...ID, credit cards, coupons, stamps, Costco card, etc. It also holds money, library cards (we have many), and a prayer card from my brother's funeral. I keep it with me always. It has a picture of him and a poem on the back. It is a sweet reminder every time I go into my wallet. My wallet I purchased from Payless last year. I use wallets till they are completely falling apart. The one before my red gem lasted me about 7 years. I want a wallet to be with me for the long haul :) Although I don't like paying $10+ for a wallet. When you factor in how long I have them for, I definitely get my money worth. Next I have a small makeup case, with all the the basics stored in it...nail clipper, tweezers, chap stick (I'm addicted), mascara, toothbrush, dental floss, headband, compact mirror/powder, hand lotion, business cards for the blog,and two pens. These all fit into the flower case up above. I use to have scissors in my purse to, but somehow they have escaped. I need to add them back in. I also keep a small pouch of wet wipes. These come in handy almost every time we're out and about. They cost less than $2 and are great to always have on hand...whether you have little ones or not. I also keep an antibacterial soap attached to the side of my purse. I am a bit of a clean hand freak, so this helps keep my mama mind at ease. So all of these goodies keep me organized and ready for whatever comes about when we are out of the house. Now I know you have got to have other treasures you store in your purse or have thought of adding. Let's share. I love getting ideas and being able to learn from all of you. So what's in your bag? You kept it real with the picture of the pad! LOL - LOVE YOU!! I have the wallet with all the cards ... and a picture of me and my brother from when we were teens ... a pad in the center pocket ... a nail file because I'm OCD and if I chip a nail I will not be able to function until I file it ... tweezers - PCOS gives you hairy face (at least me) .... Tums - fat girl gets heartburn .... a Leatherman tool (has scissors on it) .... mirror, lipstick, migraine pills ... small pack of Kleenex. Where is all the paper? Store receipts? I have a thousand pieces of paper in my purse. And a note pad. I guess I'm odd. I always say if I had a $1 for every piece of paper I carry around. I need to start using my phone for those things I guess. Just old school, here. I always have a pile of change, that my kids beg me not to count at the store, "because people know us here, Mama!" I also usually have a book and a small Bible. If I'm on my way to the office, I have a bottle of water and fruit. Have a great weekend! I never meant to get a big bag,but was gifted one by my sisters for mother's day and now......so much more stuff by the bag being bigger. When I had a small purse no receipts. Funny how that works! 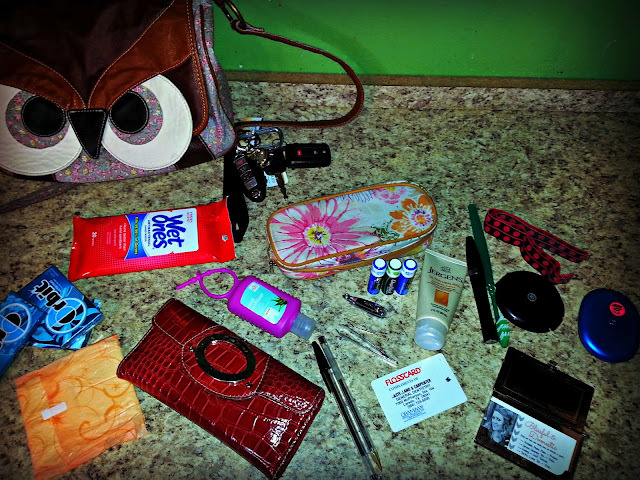 I LUV knowing what other ladies keep in their bags - I think it gives an inside glance into their personality. I carry lots of little bags myself - I like to have them all compartmentalized, lol! u should do an instagram hastag what's in your bagblissfulanddomestic that would be FUN - so u know just how crazy alike we are, lol! I luv luv luv wet wipes - I usually buy cheap baby wipes. as I'm waiting in the car rider pick up liner at school I wipe down my dash board and console area with them too. I'm with honey and pappy tho on the receipts - those are the only thing I don't have a small bag for - maybe I need to dedicate one....can u tell I luv bags?! I get so board with purses and wallets I change them out all the time. I have to say this last one I've had the longest usuage out of about 8 months. but I'm with u - not very expensive ones usually GW's $3 and under. as far as chapstick - girl! the best one I've found so far is Blistex Medicated Lip Ointment - omword it is glorious esp when u have those head cold chapped lips - a couple days later ur lips are so smooth! let me know if you do the instagram thing and I'll do it. and show u everything - even the purse I deconstructed and resewed. Let's see.. I keep different wallets/pouches in my purse. The first has my chap stick, hand lotion, sanitary napkins/tampons and headache medicine in it (along with my period, I have migraines that pop up). The next has my coupons/CVS extra care bucks/calculator in it. My first wallet has my grocery money in it. My second wallet is my main wallet that has all my other essentials in it (money, bank card, license, etc..). I always have some kind of book in my purse because I'm a constant reader.